While production benefits of providing enrichment to sows may be hard to measure, the satisfaction of seeing sows interacting in a positive way is ample reward for some. There is no denying that enrichment for pigs has been slow to catch on with pork producers. Besides the cost of materials and the time needed to install, clean or repair enrichments, producers may ask, “what’s the big deal about ‘pig toys’?” However, there is now an impressive amount of research showing the benefits of providing enrichment in to pigs, from reduced aggression, to fewer damaging behaviors and increased growth. On Canadian farms, interest in enrichment has grown recently due to changes in the Code of Practice requirements, stating that “Pigs must be provided with multiple forms of enrichment … to improve the welfare of the animals through the enhancement of their physical and social environments.” This change, along with increasing adoption of group housing for sows led a team of Canadian researchers, directed by Laurie Connor at the University of Manitoba, to study how best to provide enrichment to sows in groups. Most studies on enrichment have looked at grow-finish pigs because this is the stage when most damaging behaviors appear, such as tail biting or flank sucking, and the effects can be devastating. A few studies have been done on sows, with the general conclusion that feeding fibrous materials such as straw or hay is best: pigs are highly attracted to items that are both manipulable and consumable, and for feed-restricted sows the increase in gut fill is an added bonus. On European farms, producers are required to provide 300 grams (about half a pound) of fiber per sow per day. But North American producers are reluctant to provide straw, largely due to biosecurity concerns and the potential for straw to clog liquid manure systems. Studies in Canada have therefore focused on object enrichments that could be provided in slatted or partially slatted pens. Between 2014 and 2017, three studies were done to evaluate sows’ interest in a variety of enrichments, including wood suspended on chains, cotton rope, loose straw and a dispenser for chopped hay. The enrichments were tested on two research farms, one with free-access stall housing and one with electronic sow feeding. The way that the items were presented also varied. For example, comparing provision of one constant enrichment to a rotation of three enrichments, or varying the number provided at once from one to three enrichments per group of 28 sows. While sows interacted with all of the enrichments, not surprisingly, loose straw (placed on a solid floor) was the most preferred. Not only was the straw consumable, it spread out over a larger area, allowing more animals to interact with it at the same time, compared to hanging enrichments. Between the object enrichments, rope was slightly preferred over wood enrichment. Rotating multiple enrichments resulted in more sow interaction than provision of a single enrichment, confirming that sows appreciate a degree of novelty in their daily routine. The researchers hypothesized that dominant sows in a group may obtain greater access to enrichment than subordinates, so the impact of sows’ social status on enrichment use and stress physiology was observed. In both free-access stalls and ESF housing systems, dominant and subordinate sows used the enrichments equally. However, in the ESF barn, subordinate sows had higher cortisol levels than dominants, suggesting greater social stress in the ESF system. Sows in the ESF barn also used the enrichments about three times more frequently than those in free-access pens. Because the two barns had different management and genetics it is impossible to know what caused this difference. Sows in ESF are generally more active, but genetic differences cannot be ruled out and should be studied. In the third study, chopped hay was provided in small hoppers in the free-access pens, and was compared to wood enrichments. Again, the use of fiber attracted more sows, but because it was held in a small hopper only a few sows could access it at once. This study found that dominant sows had more access to the hay feeders than subordinates. 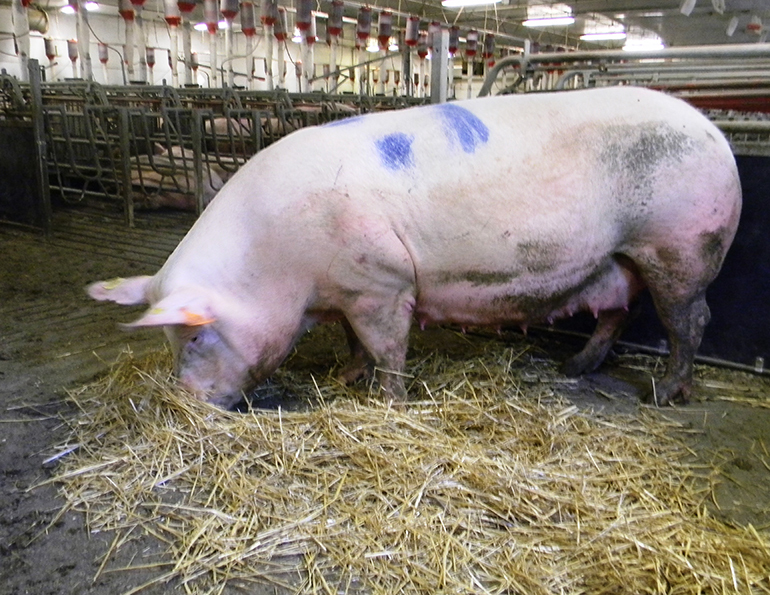 Higher lesion scores were also observed when chopped hay was given, indicating that aggression can increase when sows are competing for a more desirable enrichment, so providing adequate levels of enrichment is important. Overall these studies underscore why diffused and consumable enrichments like straw are both attractive and effective for sows. Providing a number of enrichments and dispersing them throughout the pen will help to reduce any negative effects of social status. Researchers will continue to explore the potential benefits of various fiber sources, and to look for practical enrichments that promote sow interaction while posing minimal risk to biosecurity or liquid manure systems. Following the trials, multiple farms with group sow housing participated in an extension study. Producers were used to seeing sows lying quietly for most of the day, and were surprised to see the sows’ strong attraction to enrichments. Most of all they enjoyed watching the sows interacting with enrichments. So, while the production benefits of providing enrichment to sows may be hard to measure, the satisfaction of seeing sows busy and interacting in a positive way is ample reward for some.